After 20 years of farming Kona coffee, the Bolton family thought it was time to update the look of the Kona Coffee & Tea coffee bag. In the late Spring of 1998, the first Kona Coffee & Tea coffee plants were planted by the Bolton family. Dan, Jan, their kids Malia, Danny, and Kirstina and extended family, planted the first 20 acres of arabica typica. The idea back then was just to keep this land, known as Waiono meadows, (previously a cattle ranch) agriculturally productive. Today, the farm has grown to over 200 acres, plus a successful café, and online shop. The Kona Coffee & Tea Company farm at "Waiono Meadows" in Holualoa, Kona., on the slopes of Hualalai. Dan still helps with the farm, but the reins have passed to the next generation, with his daughter Malia managing operations and Danny working the mill. 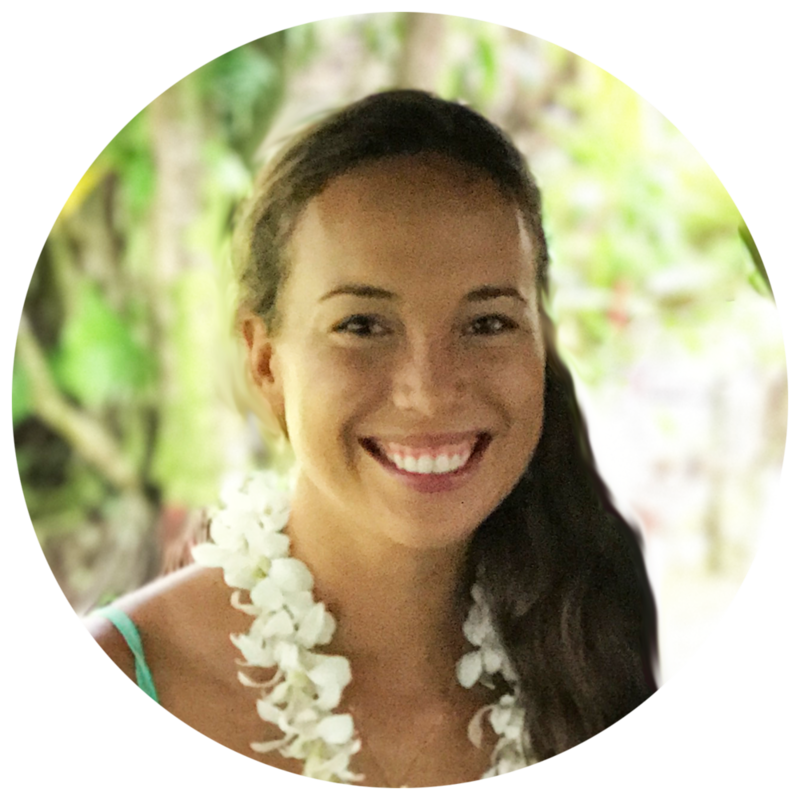 I was introduced to Malia through a mutual friend who thought two young Big-Islanders might work well together, with my background in marketing and graphic design and Malia‘s vision of where she wanted to take Kona Coffee & Tea. The original Kona Coffee & Tea Company coffee bag. At first introduction to Malia and Kona Coffee & Tea, it struck me that a family-owned coffee farm, selling only 100% Kona Coffee, could successfully take over a café location once held by Starbucks. When I learned that they were one of the few 100% Kona Coffee growers that maintained control of their entire processing - from seed, to milling, to small batch roasting, and delivering to customers - I was in. Malia asked me to work with her to redesign her family’s coffee bag. She explained that their coffee bags hadn’t been updated since they started in the nineties and they wanted the new look to reflect the care that goes into producing each batch of coffee. They had tried working with a mainland-based design firm but communicating the uniqueness of Kona and their farm-to-cup operation didn’t come through in the prototypes. The pressure was on, first to communicate what 100% Kona means to Malia’s family and second, not to misappropriate the spirit of Hawaii. We stopped into the Kailua-Kona café where I had an iced mamaki tea, and Malia had a latte. The café is a free-standing building at the entrance to the Kona Coast Shopping Center, with a lanai wrapping around three sides. It greets you as you head down Palani Road to the main, ocean-front walk, on Ali`i Drive. As we sipped and chatted, I noticed that the bright room was full of people from all walks of life, from telecommuters to teenagers and tourists. Malia explained that for her family, Kona Coffee & Tea was always more than just a business. Her Mom and Dad wanted to preserve and perpetuate what the pioneers of Kona coffee had built over the past 200 years. 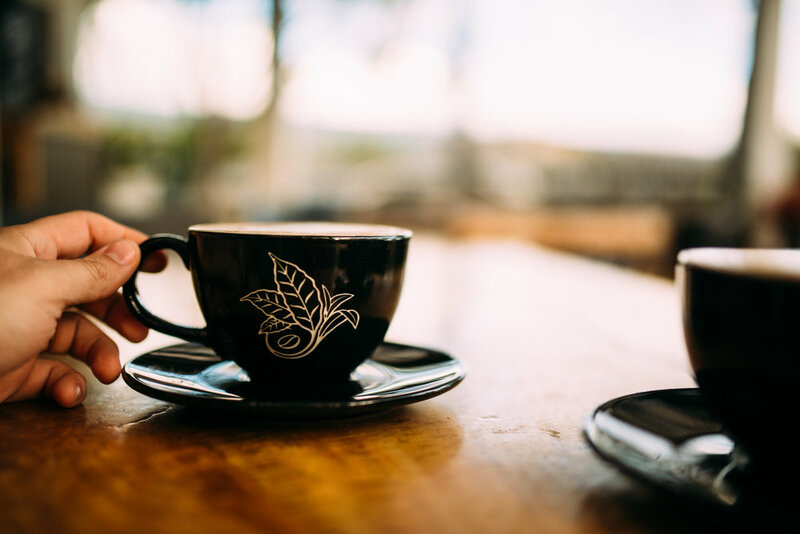 For centuries, Coffee had cultivated the multicultural community of the Kona region; connecting people to the land, connecting coffee-lovers worldwide to Kona, and providing a living for generations of families. For Malia, it’s what brought her back to the island after college on Oahu. After finishing our drinks, Malia drove us up, away from the bustling streets and beaches of Kailua-Kona to the beginning of the Kona Coffee Belt in the region of Holualoa. Turning down a gravel drive, we made our way to the Mill; a vast warehouse where the bright red coffee cherry is hulled, polished, cleaned, and graded by their wet and dry mill. Milled and dried green coffee beans are then roasted on-site by Roaster, Lani, who has been Kona Coffee & Tea’s Roaster for the past 15 years. As we watched Lani, smiling shyly, use a metal scoop to pour a batch of green beans into the top of the roaster, Malia explained how she roasts different grades in 25 lb. batches of light, medium, full city, or dark roasts. Then Lani smells, tastes, and inspects each batch to ensure quality and consistency. We left the sweet smell of fresh roasted coffee behind and continued up the slopes of Hualalai to the Kona Coffee & Tea farm. After about ten minutes on a bumpy one-lane road and opening and closing a few gates, we were engulfed in coffee fields at 2,000 feet above the Pacific below. It was completely quiet, except for the calls of birds and the gentle hum of bees. Peppered throughout the landscape, native ohia lehua trees towered over the coffee bushes. It was spring and the Kona snow, the colloquial name for Kona's coffee flowers, covered the verdant landscape. Malia explained that she wanted the new coffee bags to feel as special as the farm does, reflecting the full farm-to-cup operation in Kona. She mentioned dressing it up with a Hawaiian coffee print, like an aloha shirt. As we discussed what the new bags of coffee should look like, I took pictures of the big waxy leaves and delicate white blooms. Malia promised to send photos of the bright ripe coffee cherry from last summer. Afternoon clouds slowly rolled in, obscuring our view of the expansive Kona coast below. As we drove back down the hill we developed the concept of hand drawing what I saw on the farm and piecing it together on the new bag. For the bag colors of three primary roasts, light, medium, and dark, we stayed away from the common coffee shades of copper and chocolate and picked colors from the coffee growing and milling processes. The creamy color of a dried coffee bean, right before milling, was chosen for light roast. The bright hue of a green coffee cherry in mid-summer depicts the medium roast. And lastly, for the dark roast, we chose the color of the dark volcanic rock of Hualālai, from which the coffee grows. The colors of the new bags were inspired by the Kona Coffee & Tea farm and mill. It was many months before we had something we felt comfortable showing the rest of the Bolton family and the team at Kona Coffee & Tea. And many more months to reach the point of deciding exactly what would replace the iconic purple bag that had held their prized coffee for almost two decades. You can now find the new packaging in the Kona Coffee & Tea café, in Kailua-Kona, and in their online shop. Thank you to the many hands and minds who have contributed to this project and most of all to the loyal Kona Coffee lovers all over the world. We hope you enjoy the new look! I was lucky enough to be born and raised in Hilo, here on Hawai`i Island. My formal training came from studying business and design at Loyola Marymount University. My informal training came from being the lowest on the totem pole at a goliath advertising agency, teaching English in Korea, managing a Senator’s office, and nonprofit fundraising. After living in Los Angeles, Seoul, and Honolulu, I made my way home and I started my own marketing and graphic design business in 2016. When not staring at a computer, I enjoy cooking (eating), surfing, and free diving. Mahalo to Kona Coffee & Tea for the opportunity to work on this design project!